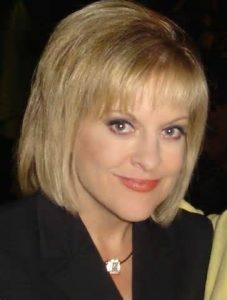 Nancy Grace was born on October 23, 1959 in Macon, Georgia, USA as Nancy Ann Grace, the daughter of Elizabeth and Mac Grace. She is an American legal commentator, television host, television journalist, and former prosecutor who is the outspoken host of HLN’s top-rated show, Nancy Grace. She frequently discusses issues from what she describes as a “victims’ rights” standpoint, with an outspoken style that has brought her both praise and criticism. She has been married to David Linch since April 21, 2007. They have two children named Lucy Elizabeth and John David. *She attended Valdosta State University, Valdosta, Georgia, United States; Mercer University, Macon, GA, US (BA, 1981); Mercer University, Macon, GA, US (JD, 1984); New York University, New York, NY, US (LL.M. in Constitutional and Criminal Law). *Her TV appearances stress the morbidity of violent crimes. *She married Atlanta investment banker David Linch in 2007, and gave birth to twins, Lucy and John, later that year. *She volunteered on a hotline for an Atlanta battered women’s center for 10 years. *She appeared as herself in the 2008 superhero movie Hancock. *Follow Nancy Grace on Twitter, Facebook and Instagram.